While the E21 BMW 3-series shares significant responsibility for the 3-series being what it is today, E21s are largely ignored by enthusiasts. They suffer from heavy safety equipment, dubious aesthetics caused by that equipment, and low-powered engines designed with a primary goal of passing emissions standards and maintaining a semblance of driveability. That makes European market models – especially the 323i – much more appealing, and secondarily North American cars that have had European market parts retrofitted. 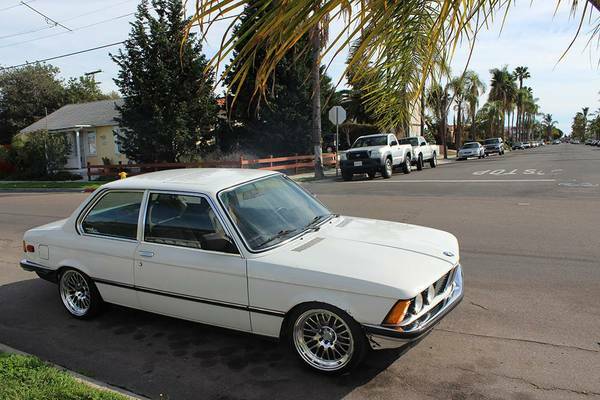 You can find this 1982 BMW 320i for sale for $1700 in Normal Heights, CA. As you can see, the slim European bumpers do wonders for the aesthetics, if not safety, and they should also improve the handling by removing significant weight at each end of the car. It’s a safe assumption that this is a converted North American car, but you will want to check with the owner so you can be assured of passing smog inspections. And on that note, the car currently has no catalytic converter, but the seller will provide one for extra cost. Just short of 200,000 miles, the exhaust is smoky, so you may be looking at some internal work to get the car past the visual (no-smoke) inspection. The trick is to find a good engine (or parts car) that will allow you to make the most of the fancy wheels and bumper conversion. Driver and passenger seats are also said to need attention, as are the turn signals. The body is not perfect either, but looks to be acceptable for a driver you won’t have to worry about in parking lots. The car is fitted with a 5-speed manual, the most desirable set up on a 320i. What would you do with this? 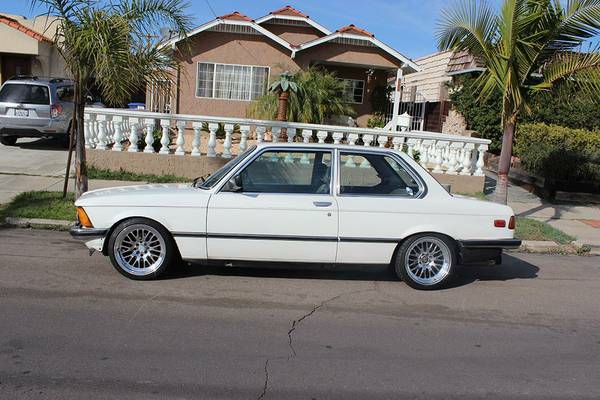 The seller has already attended to some of the aesthetics (okay, the wheels and lowering won’t be to everyone’s taste) – how hard would it be to drop in a six from an E30, or a four from an E30 318is? With the latter, you might get really close to the 2002 experience without 2002 prices. This entry was posted on February 18, 2014 at 11:46 am and is filed under Feature. You can follow any responses to this entry through the RSS 2.0 feed. You can leave a response, or trackback from your own site. The bumpers actually got my attention first and foremost – of course, if the conversion is easy you could just buy the car, pull the bumpers and put them on something nicer, say an ’83 is. There were so many downright pretty hatchback coupes in the air in the ’70s, it’s a shame BMW went with such a boxy two-door sedan. It’s like the design department couldn’t decide what kind of car they wanted to build and ended up with the worst of both worlds – bland, boxy non-styling with contortionists-only rear seat access and a tiny trunk. Good thing the engine and chassis engineers knew what they were doing. Love the look of it….